In an industry that has been historically considered somewhat “dangerous,” there is great significance attached to a woodworking company that is honored nationally for its safety record. Add to this Keystone’s comparatively small size (52 employees), the recognition is all the more gratifying. As one of only twelve companies across the nation—including Delta Airlines Inc., Marathon Petroleum Co. LLC, Frito Lay Inc., and Union Pacific Corp. among others—Keystone’s recognition proves that you don’t have to be a big company to achieve big results. 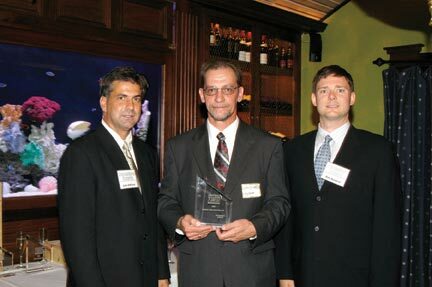 Keystone’s Dave Landis, Safety/Compliance Coordinator (center), accepts Occupational Hazards magazine’s “America’s Safest Companies” trophy from Penton Media Vice President John DiPaola (left) and Penton Media Publisher Rob Howlett. “It is unheard of for a woodworking company to achieve such an honor,” says Keystone president and owner Sam Stoltzfus. 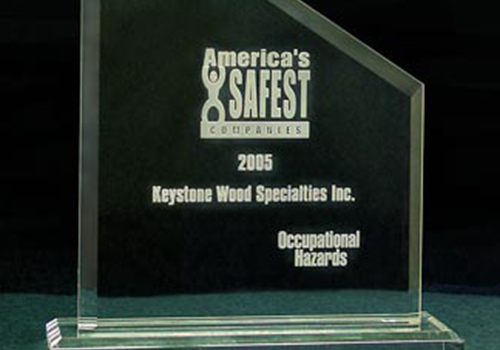 Founded in 1972 as S. D. Stoltzfus Cabinet Shop, the company’s focus was changed to wholesale cabinet components in 1984, and the name became Keystone Wood Specialties Inc. From the beginning, safety was a primary priority, and in October 2003, Keystone was awarded OSHA’s SHARP certification. The “America’s Safest Companies” award is given to qualifying companies each year by Occupational Hazards Magazine, a publication of Penton Media, Inc. in Cleveland Ohio. This year the ceremony was held in Orlando Florida on September 21. The recognition takes into account such factors as the company’s health and safety record, their safety policies and procedures, owner/management involvement, and creative innovation—steps that go beyond industry requirements to address a real need. One such innovation at Keystone is their computerized Preventive Maintenance system designed in house by company management personnel. The program tracks the history of each piece of equipment—purchase date, repairs, maintenance, etc. The system automatically prints out daily maintenance/repair schedules and machinery lock-out/tag-out procedures including guards and emergency stops. As repairs and maintenance are completed, that information is also logged. Keystone is in the process of packaging the software, so other companies can use it. As a result of Keystone’s aggressive and innovative safety program, recordable injuries were down to only 3 over the last three years. They have reduced their EMR (Experience Modification Rate) by 18%, and they are expecting future numbers to be even lower. While no company is perfect, the management at Keystone sees no reason why it can’t try! It begins with an attitude that starts at the top and is generated throughout the organization—valuing people as well as profit, and employees as well as customers. Suggestions from employees are always seriously considered. Many times the workers are the eyes and ears that catch situations before they become problems. When employees are invested with “owning” part of the process, they help create a positive, safety-motivated community. Keystone’s philosophy maintains that in a safe and thriving work environment, everyone benefits. Injuries are costly, both to the employee and to the company. A healthy work culture where people know they are truly appreciated and respected results not only in higher productivity, which is good for the company and its customers, but it results in a work force that is loyal both to the company and to each other. And that’s good for the employees and their families.